What's Going on at EEDA? Click the image below to register for EEDA's annual Gala on May 10th! Check out the video below highlighting DSP NatLye Long from Calverton Day Hab. Thank you so much for all your hard work and dedication! Check out the video below highlighting Senior DSP Sahlise Cherry from our Marion Lane house. Thank you so much for all your hard work and dedication! Check out the video below highlighting Senior DSP Adam Weyant from Riverhead Day Hab. Thank you so much for all your hard work and dedication! Fifteen people who attend EEDA day programs recently completed an art workshop, Exploring the Creative Spirit, at the East End Arts School! ​SURFERS HEALING MONTAUK, 2018: Click the Video Below! ​6th annual Long Island Imagine awards! In partnership with The Gateway, Performing Arts Center of Suffolk County, EEDA's Creative Arts Program performed This is Me: Songs of Hope and Heart on August 24th, 2018. Congratulations to EEDA's Creative Arts Program on a beautiful performance! Ribbon Cutting Ceremony for the new CAP space at the Henry Pfeifer Center. Thank you Laura Jens Smith and the Riverhead Town Board for making this happen! EEDA's partnership with FoxRun Farms provides EEDA program participants with equine therapy and the opportunity to learn animal care skills! 2018 Gala eJournal now available! ON TUESDAY, MARCH 28th HISTORY WAS MADE AFTER MORE THAN 300 DAYS OF ADVOCACY, GOV. CUOMO MADE AN ANNOUNCEMENT AT THE STATE CAPITOL BUILDING IN ALBANY: THE NEW YORK STATE BUDGET WILL INCLUDE $55,000,000 TO ENSURE DIRECT SUPPORT PROFESSIONALS RECEIVE A LIVING WAGE. THIS IS $10,000,000 MORE THAN THE #bFair2DirectCare CAMPAIGN WAS ASKING FOR! EEDA self-advocates and staff were front and center at this historic event. Self-Advocacy President Christine Barker and front-line supervisor Shaunice Faines spoke at the same podium as the governor! EEDA Self-Advocates and staff, moments before the governor made his historic announcement. “We’re proud to be working with East End Disability Associates- a group of caring, concerned professionals, who do so much for so many every day. 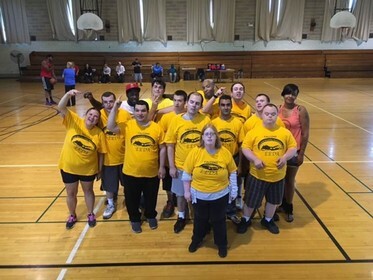 Beyond the great work they do to enrich the lives of their clients, the staff at EEDA serves to remind us that kindness and compassion make our lives more meaningful,” said Riverhead Supervisor Laura Jens-Smith. 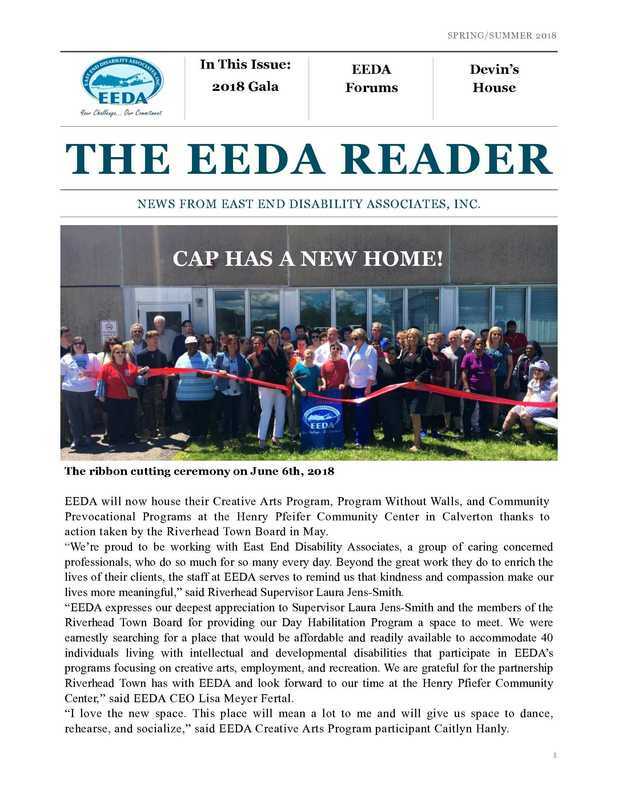 EEDA self-advocates and staff sit down with Riverhead Local to discuss the importance of Medicaid and what it means for the people we support. EEDA on the front page of the Riverhead Times Review in response to the $15 minimum wage proposal and how it would affect us and other agencies. Click below to listen to our radio commercial! ​In 2016 the EEDA Falcons took back the first place trophy! What a season! We played the Titans in the championship game. They have been undefeated for two years, and we battled them for a huge win! Our coaches worked really hard this year on bringing the team together to play as one, and they accomplished just that! Great job coaches Krystal and Sean! A very big congrats to all of our players for all of their efforts and hard work, Chris M, Paul D, Steven B, GianCarlo G, Matthew S, Hashim R, Erin B, Jamison, Nick H, Susan G, Courtney M, Jamey G, Matthew L, and Matt S.
Matthew Kuriloff, EEDA's Creative Arts Program Coordinator, received ANCOR's DSP of the Year for New York State in 2014. He also presented his experiences on a national webinar sponsored jointly by ANCOR and AAIDD to help celebrate Direct Support Professional Recognition Week.